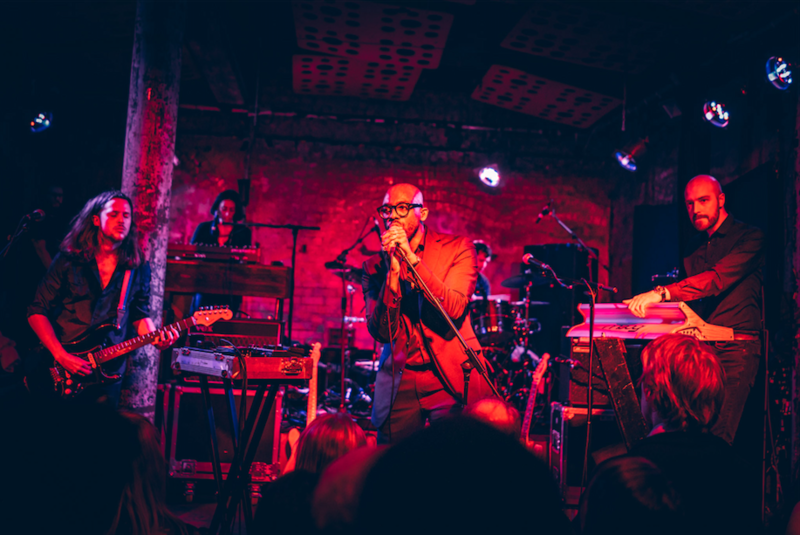 Following the release of his eagerly anticipated new album Dark Days + Canapés, it’s no surprise Ghostpoet’s Glasgow show is sold out. Accompanied by his band, poet and musician Obaro Ejimiwe fills the crammed yet cosy venue with his pastor-like aura, preaching to crowd of firm believers in his music. As he comes on stage, dressed in a modest black suit, we can tell that this gig is going to be a somewhat sincere affair, as his harrowing new album depicts a sombre social commentary on what the world has become. The crowd responds enthusiastically, appreciating every word Ejimiwe utters as we are all very much hooked on the story he is telling. The seamless blending of melancholy beats starts to develop a rather repetitive rhythm, making it tough to distinguish one song from the next, though nevertheless creating an enthralling trance-like atmosphere of being captivated by the tempo. The candour of his words reiterates why Ghostpoet was nominated multiple times for the Mercury Prize – the stories he paints through his monologues illustrate a different take on social issues from the norm. He is clearly a talented storyteller, frequently repeating his lyrics as a way to make his message resonate further with the audience. Despite a slow burning set of solemn melodies reminiscent of the gloominess portrayed by early Bloc Party, the pace occasionally picks up with a somewhat subtle drum and bass vibe, with flashing lights enhancing the fast energy of the songs. As he plays ‘Immigrant Boogie’, we witness the eloquence of his knack for spoken word, with the song illustrating a hope for a better future and the effects of that hope being snatched away by forces outside the singer’s control. Further on he earnestly admits a mistake by saying “I fucked up, you people paid good money” and restarts the song, to which the audience responds by being very much supportive. This summarises the genuine feel of the night, and though slightly monotonous at times, it’s clear to see why Ejimiwe says it was the best show of the tour so far.